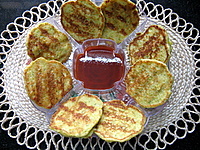 Sweet corn cakes recipe is so easy to make that even children can make them (under supervision of course). A food processor comes very handy for this recipe. You can use fresh corns from the cob or corn kernels from the can. If using frozen corn, thaw them first and carry on with the recipe. Put ¾ of the corn kernels, the onions, eggs, coriander, chili, 100 gm of flour, baking powder, salt and pepper in a food processor and process until combined. If the mixture is looking very thin and watery, add some more flour and combine. Sneak a taste and make adjustments if any. Add the remaining sweet corn and stir. Heat 1 Tbsp of the vegetable oil in a non-stick frying pan over a medium-high heat. When the oil is hot, drop 2 heaped tablespoons of mixture per cake into the pan and cook in batches of 4-5 for 3-4 minutes on each side. Drain on paper towels. Serve with a hot chili garlic sauce or a tomato salsa . Note:-Make smaller size cakes (about 1 tbsp of corn mixture per cake) and serve them as a party appetizer.